The Dynamite Room explores a huge 'what if...' of the Second World War. What if German soldiers had reached British shores? What if there had been an invasion? The novel begins with an 11 year old girl called Lydia making her way home to the house she grew up in in rural Suffolk, after escaping from her temporary evacuee home in Wales. She is shocked and scared to find the village and her house eerily empty and sets up home, willing for her mother to return. That evening, while she is trying to sleep, she hears noises downstairs and finds a wounded soldier. He speaks with a German accent, tells her that there is an invasion on its way and gives her a list of rules to live by - she must not leave the house and she must do as he says or he will kill her. As Lydia and the soldier get used to each other's presence in the house, we learn of each of their experiences during the war and the heartbreak which they are both recovering from. With a sense of desperation and claustrophobia, these two characters begin to interact with each other and The Dynamite Room becomes a disturbing, compelling and moving story of two unlikely residents of a village house. 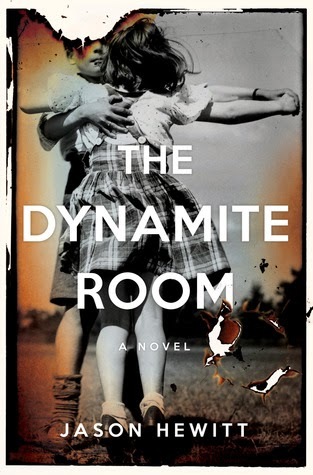 The Dynamite Room is a stunning debut novel. It is gripping and compelling with an almost poetic touch, with the garden blooms and Lydia's young innocence in stark contrast to the brutality of war and the soldier's experiences. There are equal amounts of beautiful and shocking imagery as the solider almost cannot believe the sights that he has seen and been involved with. His memories have a sense of detachment to them and Lydia's actions and thoughts feel very authentic of a scared 11 year old girl. The pair's relationship as they prepare the house for expected guests as a result of the invasion and the complexity of everyday chores, such as providing food for each other, feel very genuine. I have loved WWI and WWII literature since doing A Level coursework on the subject and The Dynamite Room succeeds in being a unique take on the Second World War, using rumour / propaganda of Germans arriving on British shores and the little-known conflict in Norway at the battle for Narvik. This feels like a very well researched and accomplished novel. I was gripped throughout and the final scenes had my heart pounding, I hadn't had a reaction like that to the end of a book since reading M.L Steadman's excelling The Light Between Oceans. Ultimately The Dynamite Room explores human bonds in even the worse of situations and these are two characters that will certainly stay in my mind for a while.